Hello! (Can anyone explain to me why that feels so strange? Why I prefer to say 'Greetings' or 'Salutations' - Maybe I have issues and just need to learn to say it to people more. Well, I'm testing it out here) So here are some photos of what I've been wearing today. I don't know why, but when I got dressed this morning, I did not feel like much colour. 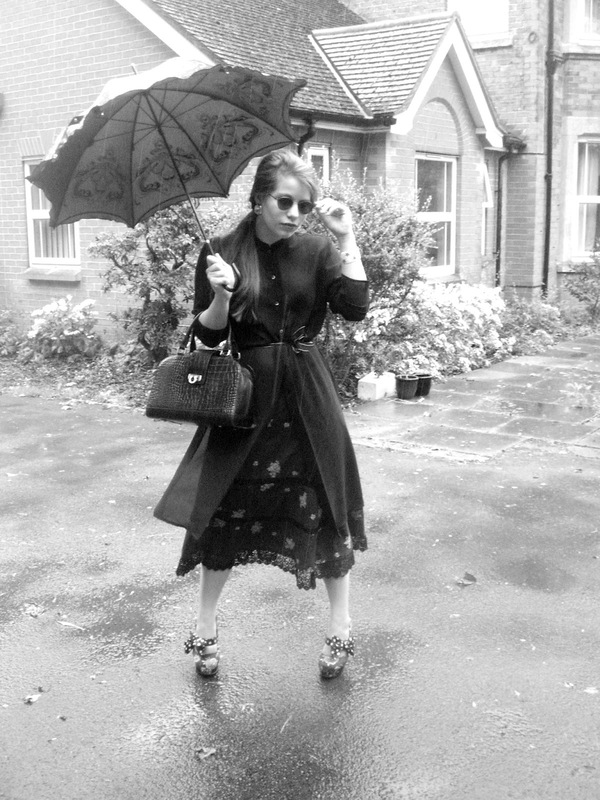 I felt like wearing black clothes, clip-on faux diamond earrings and sunglasses and carrying a black umbrella as I trotted through the rain, like a sort of reluctant young widow in stilettos who drinks too much. Or has a reason to hide her identity and doesn't understand the concept of 'blending in'... just like all these celebrities who wear sunglasses in the middle of winter and wonder why people realise they are celebrities. So... What am I wearing? A Black gauzy tunic-blouse - Thrifted from a Charity Shop. Black skirt with golden details and sequins - Vintage. Black Pia Handbag - I actually nickname her my 'Jewel' - she was just so glossy and purty-ful when I bought her... and she was half price! If there is one thing that never fails to make me happy it's the words 'Half Price'. Black Ribbon with white border from an Art supplies shop. Used as a belt you really cannot go wrong. £1 earrings from a local shop which sells end of the line accessories. Rimmel London Blood Red lipstick. Starry red and white bangle, bought for £1 from the same shop as the earrings. Radley umbrella - a present from my EPIC Maman. I love it so much... it's light, beautifully shaped and has the loveliest handle. IMPORTANT NOTE: When buying nice umbrellas, handle is key. Circular Sunglasses. I have no idea where they are from. You'd have to ask my brother since he is the one whom I stole them from. It's his fault for going on holiday without them and leaving them on the Kitchen Table. #Some people never learn. I am rather glad that the pictures came out this way... it could have been so much worse bearing in mind I had to pry my Father away from his beloved computer to go out in the rain without being able to hold an umbrella to take pictures of me. I think I may have got what I deserved for putting him through this traumatising experience though. I fear I may have the beginnings of a cold. Ah-choo! ^^^ Individual shots of my Jewel and my beautiful new umbrella. I should give her a proper name too... Any suggestions? ^^^ Another look into the psychology of MOI... Why can I never resist taking a picture of a tree? Why? Even if there are better pictures of trees and more interesting trees and nobody wants to see my photo of a tree. Why do I take the photo? And why do I feel the need to include it in a post? Well, I always say that if you have an ugly house, you plant trees around it... maybe that works with ugly blog posts. Hope you didn't catch a cold:( Anyhoo, really liking the outfit! You can never go wrong with black, right? I love the outfit! Very elegant! i love your 'jewel':) its so classy! these are some great shots btw, love the lonely widow thingy going on! loved this vintage look on u !Thanks so much for ur comment on my blog ! If u want we can follow each other on gfc n bloglovin. Let me know. Elles sont très belles et stylées ces photos. J'aime beaucoup l'ambiance qui s'en dégage et ce décor est bien choisi. Très élégante cette tenue. De jolies pièces. thnx fr your comment dear.. I have followed your fabulous blog! You look lovely...hope u didnt catch the flu! i can definitely see the widow inspiration! i like the look a lot really mysterious! Love your outfit, it's so romantic. THe umbrella is beautiful! saying 'hello' does feel strange - i often start emails with that but it seems too formal and odd when you consider saying it aloud! Such a gorgeous outfit!! And I love the umbrella!! wow ! amazing outfit doll ! this photos make me reminds me of mary poppins! :) love this photos! I missed the smell of the rain.. it haven't been raining for a long time here in Dubai. For the past 2 years it rained in total of 10 minutes and I missed most of the minutes! Cool outfit by the way :) Thanks for visiting! I Love the Outfit and that Style! 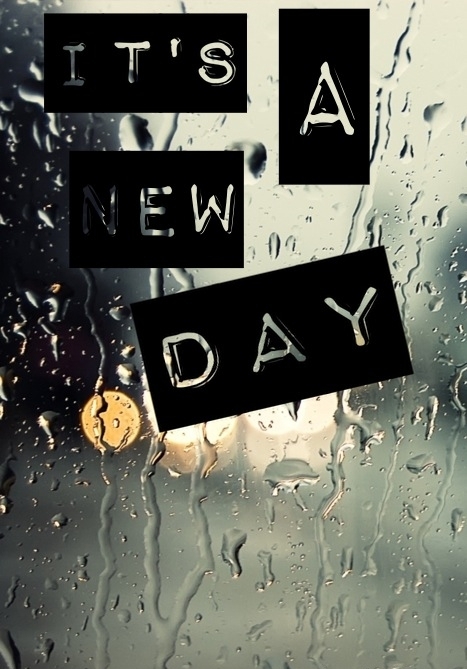 Love your look for a rainy day! Especially the umbrella.. beautiful piece. Thank you for the comment & support! :) Stop by anytime again.